Thereâ€™s no place like home-style when roasting the big bird. 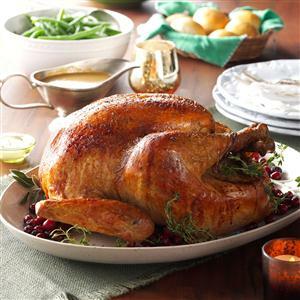 Instead of sage stuffing with turkey, stuff this bird with fresh sage and sprigs of thyme. Remove giblets and neck from turkey. Reserve turkey neck; refrigerate, covered, overnight. Place turkey in a 15x10-in. baking pan, breast side up. Secure skin to underside of neck cavity with toothpicks. Mix salt, sage and garlic powder. Tuck wings under turkey; tie drumsticks together. Pat turkey dry. Rub outside of turkey with salt mixture. Refrigerate turkey, loosely covered, overnight. Preheat oven to 475Â°. Place onion, celery, carrots and reserved neck in bottom of a broiler pan; add 1/2 cup water. Place broiler pan rack over top; transfer turkey to rack. Rub outside of turkey with oil; sprinkle with pepper. Pour wine and remaining water into turkey cavity; add sage and thyme sprigs. Place turkey in oven, legs facing toward back of oven. Roast, uncovered, 40 minutes. Reduce oven setting to 350Â°. Cover breast tightly with a double thickness of foil. Roast 1-1/2-2 hours longer or until a thermometer inserted in thickest part of thigh reads 170Â°-175Â°. (Thermometer should not touch bone or fat.) Remove turkey from oven. Let stand, uncovered, 20 minutes before carving. Using a turkey baster, remove liquid from turkey cavity to a large measuring cup. Line a strainer or colander with cheesecloth; place over measuring cup. With a slotted spoon, remove vegetables from bottom of broiler pan, reserving 1-1/4 cups. Discard turkey neck. Strain cooking liquid into measuring cup. Skim fat, reserving 1/4 cup fat. Add enough broth to the cooking liquid to measure 2 cups. In a large saucepan, mix flour and reserved fat until smooth; gradually whisk in broth mixture. Bring to a boil over medium-high heat, stirring constantly; cook and stir 1-2 minutes or until thickened. Add half of the reserved vegetables. Puree gravy using an immersion blender; or, cool gravy slightly and puree in a blender. Stir in sage, pepper and remaining vegetables; heat through. Serve with turkey. Yield: 16 servings (3-1/2 cups gravy).